I know the NES had some terrible box art too, but c’mon, Sega, put a little effort into these. Yu Suzuki strikes again!… er, kind of. 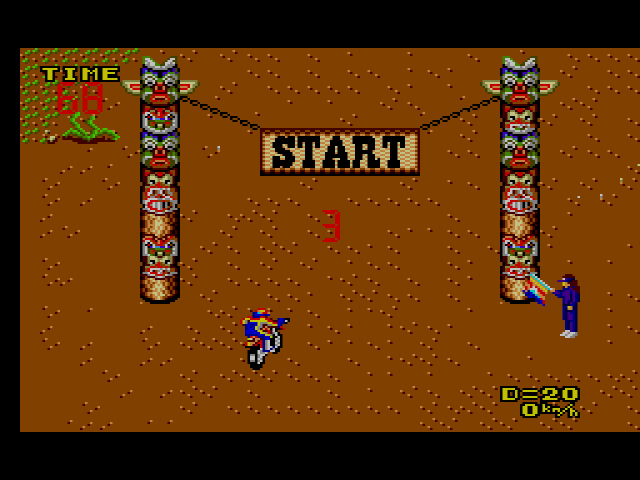 The arcade version of Enduro Racer was Suzuki’s follow up to the successful, influential Hang On. 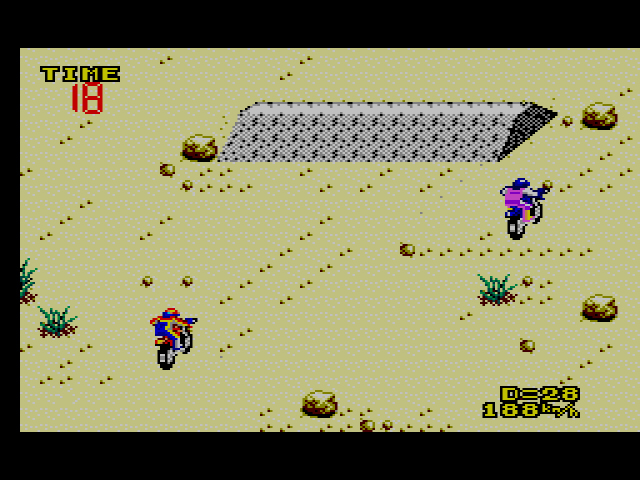 In both games, you ride full-sized motorbikes as fast as you can in order to beat the time limit before it reaches zero. The only real difference between the two is that in Enduro Racer, you ride a dirt bike and are able to pull wheelies by lifting the front of the bike as you jump off of ramps; whereas in Hang On, you ride a standard motorbike, and all you do is (wait for it) hang on. 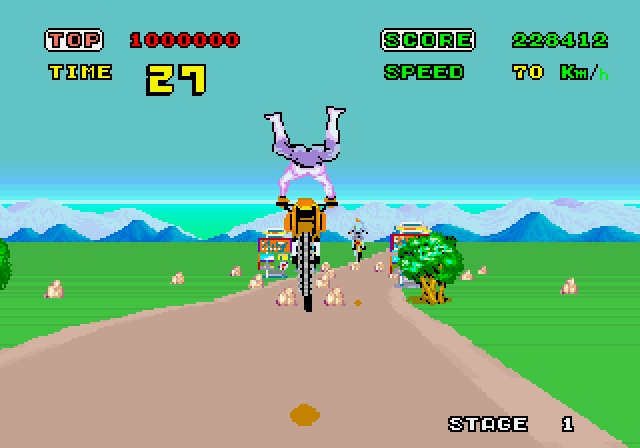 When Hang On released, the idea of riding a full-sized bike to control a game was fresh. For better and for worse, Hang On ushered in the concept of large-scale arcade machines that gave the player enveloping, jarring experiences – experiences that they couldn’t get at home (see also: After Burner, Space Harrier, those horrible skateboarding/snowboarding games). 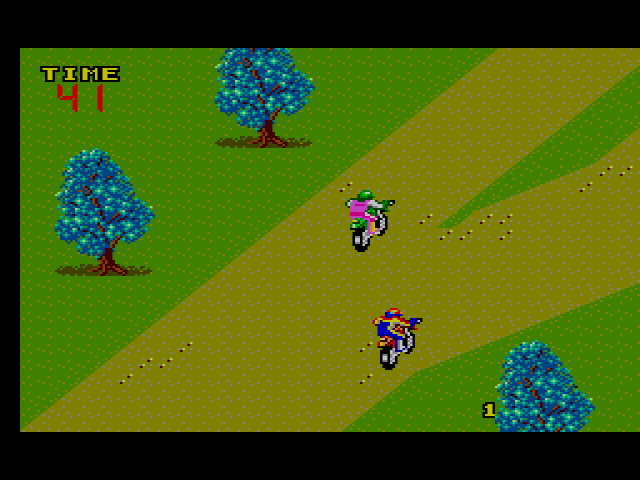 But while Hang On wowed bored arcade goers with a never-before-seen crotch-rocket, Enduro Racer replicated its predecessor’s style, while adding wheelies, dirt, and unforgiving difficulty. Even forward-thinking innovators have their lazy days: Enduro Racer is Suzuki spinning his wheels. Remember Space Harrier‘s Master System port? The game pushed the console to its limits, which is a polite way of saying it looked and played like crap compared to its arcade brother. Both the arcade versions of Space Harrier and Enduro Racer ran off of “Super Scaler” technology built specifically for the arcades. To bring these games to the Master System, Sega’s programmers had to get creative or risk them looking/playing poorly. 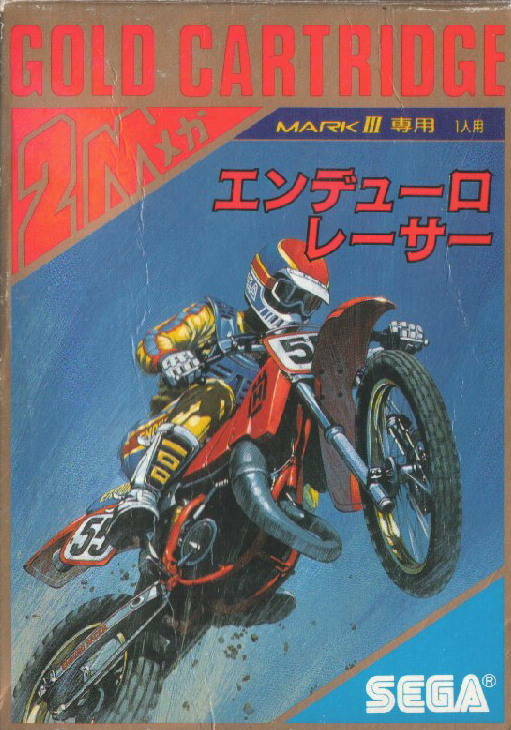 Thankfully, for the Enduro Racer port, Sega got creative. They wisely changed the look of the entire game and added features that gave the game reasonable depth. The changes worked in Sega’s favor. Enduro Racer plays like an arcade experience tailored for the console rather than a half-working port. There’s no need for that bubblegum ensemble, Mr. Racer. In the arcade, the camera viewpoint stayed behind your racer, just as in Hang On. 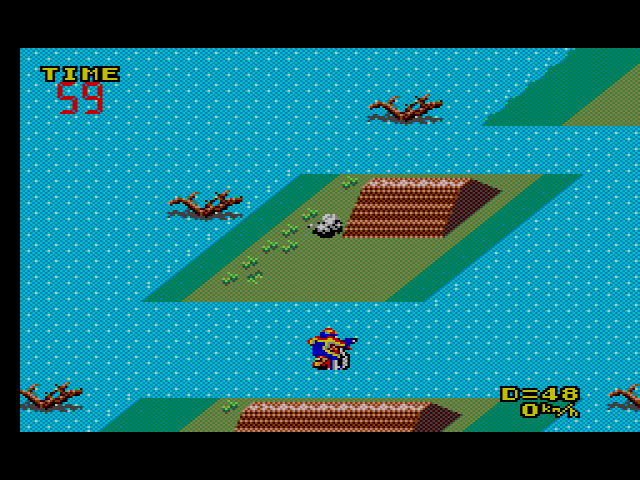 The Master System version, however, places the camera from an isometric angle, giving you a wider view of the tracks. As in the arcade, ramps actually slow you down unless you have equipped enhancements that reduce your loss of speed (engine upgrades and suspension, respectively – more on these in a bit). I’ve never played a racing game where the ramps actually hinder your progress instead of sailing you forward a la Excitebike. There’s a bugger full of ramps in this game too. It’s not uncommon to hit four or five in a row, which means you’ll be turtle limping across the track if you continue to drive over them. This unique approach sounds like it could be frustrating, but I liked the way Enduro Racer forced you to memorize your environments and maneuver accordingly. Instead of just cruising over ramps and poppin’ wheelies with little to no difficulty, you have to take in the various terrain – desert, water, grass, etc. – and drive all around, avoiding what hinders you. 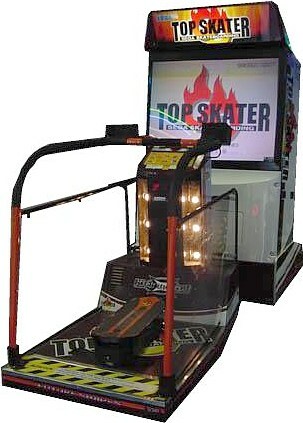 As in the arcade, you can perform wheelies off the ramps by pressing the D-pad down as you jump. They give you an extra speed boost if you land them right (negating the loss of speed the ramps provide), but they’re not imperative to beat the race. These ramps were placed here by native tribes several eons ago. Additional AI racers were there just to be in your way in the arcade version, but in the Master System version, they have a purpose. When you pass one on the track, you’re given a point which you can use to enhance your bike at the end of each race. The enhancements – acceleration, tires, handling, suspension, etc – are crucial in your beating the later races, but keep in mind that, even if you pass a lot of racers, you won’t ever have enough points to completely overhaul your ride. Experiment to find the enhancements that work for your racing style, then drive from there. Is that Skrillex holding the flag there? Instead of just exploding when you touch an obstacle, like in the arcade, different environmental objects pose different threats. Rocks and stubble and all-around smaller items give you four damage points, while fully crashing and/or burning into walls and signs costs ten damage. The damage accrues across the levels, and once you hit 99 damage, the in-game timer counts down twice as fast. You can purchase items that reduce your damage, but they’re a gamble as to how much damage they’ll reduce; sometimes they’ll lower it by 30, other times only 10. Basically, don’t wait until you’re already at 95 damage to buy one, as it might not help you that much. 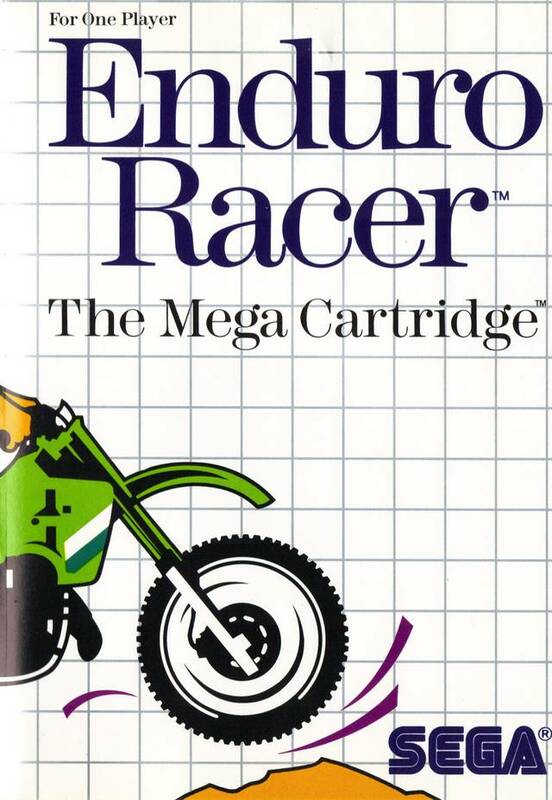 I’m not sure why Sega decided to change their approach to Enduro Racer (other than the obvious technical limitations of the Master System), but kudos to them for not playing it safe. The enhancements and unorthodox approach to racing make Enduro Racer much more than just Hang On’s Redneck Cousin, The Game. They show that Sega was learning how to differentiate from console development and arcade development, and might I say, it’s about dang time. Wheelie on, you crazy dirt bike. Haven’t played it myself but looking at those screencaps I can’t help but be reminded of the trial bike sections at the end of each level of Paperboy. Yes! It does have a little bit of a Paperboy feel. Good call, Tony. If you tap down before you hit the ramps you won’t lose speed on them and you will gain some air. You need to get your timing right but when you do it adds an whole new dynamic to the game. This is great fun for the 8 minutes it lasts, although to be fair it’s very replayable. I couldn’t sleep one night a few years ago so I played through this and Baku Baku Animal. Both endings are beyond hilarious.